The inaugural flight of Emirates, which landed at the airport on July 1st at 9:20 pm, kicked off a new daily air service linking Phnom Penh and Dubai with a stop in Yangon. 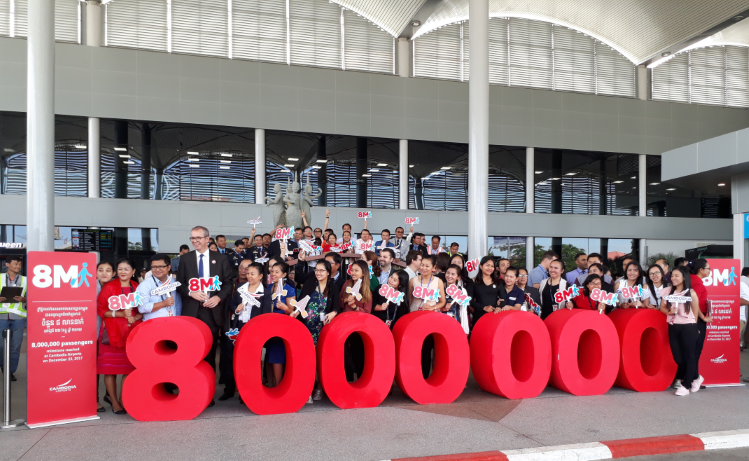 Cambodia’s capital city airport and travellers to/from the Kingdom should significantly benefit from the connection with Dubai airport, the world’s number one hub for international passengers. This Emirates aircraft touching down at Phnom Penh International Airport brings a wealth of opportunities by further bolstering Cambodia’s profile as one of the fastest growing economies and most popular tourism destinations in the region. It will be instrumental in boosting the airport connectivity and the number of air travellers. It also comes as the reward of Emirates’ and Cambodia Airports cooperation, together with Cambodian civil aviation authority, throughout the years. The 3 international airports, strategically located and serving the country’s 3 economic and tourism epicenters, currently handles more than 30 airlines serving more than 40 destinations. As main entry points to Cambodia and hubs serving other destinations within the country, the airports are drivers for the economy. The direct, indirect, induced and catalytic impacts of the international airports represented 17% of the GDP and 1.7 million jobs or 20% of the working population of the country.